lsw doesn't plug into generic tooltips, but i suppose it could. i've long wanted to add lsw info to recipes, but i'd need to add a database. it would be nice when buying recipes to know what the profits for that recipe might be like. I've always wanted something like this as a guideline for pricing -- what does it cost me to make this item? 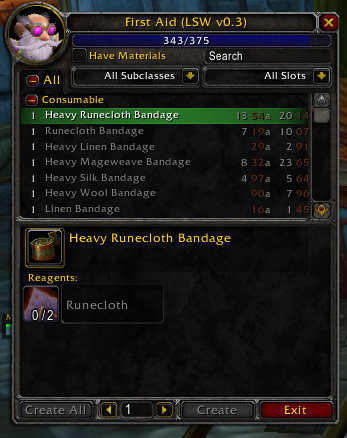 Are the things currently listed on the AH cheaper than my costs, or can I safely undercut them and still turn a profit? It's possible to open up the crafting window and look it up, but doing that for even a small percentage of the items I'm listing can be painful. Having that information in the tooltip would greatly speed up the process.